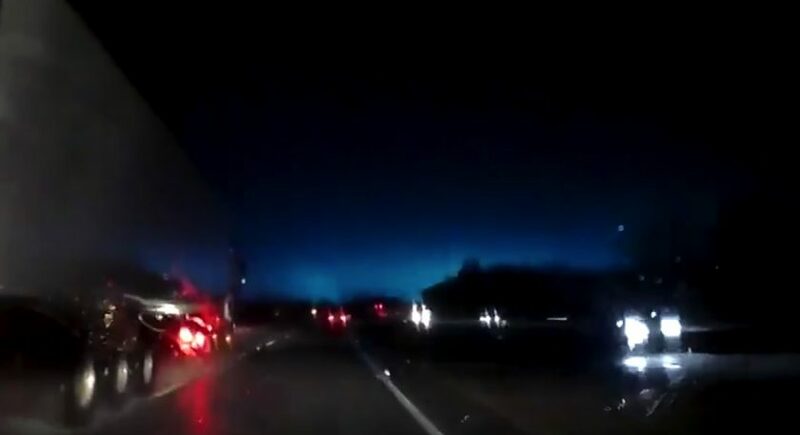 A mystery ‘blue flash’ was spotted in the sky above Flintshire early this morning. A few people posted the ‘oooh its an alien’ type thing …. A member of the Hawarden based Police helicopter team (NPAS HAwarden) captured the mystery blue flash on dashcam while travelling to work along the A55. One suggestion from the team at NPAS Hawarden is that it could have been ball lighting – which is “an unexplained and potentially dangerous atmospheric electrical phenomenon” according to Wikipedia. “The term refers to reports of luminous, spherical objects that vary from pea-sized to several meters in diameter. Though usually associated with thunderstorms, the phenomenon lasts considerably longer than the split-second flash of a lightning bolt.” It goes onto say. Another explanation could revolve around a power cut in Buckley which happened at around the same time, a powerline was struck by a tree knocking power off to properties in the area. Elfed High School has been forced to close today due to the intermittent power and no heating. Did you see the blue flash?